TATE BYWATER is the law firm of choice for folks in Fairfax County, Vienna, Prince William County, and beyond. Since 1972 the firm has expanded from a single-office in Vienna, Virginia to become a well-oiled machine, being a multi-office, full-service law firm that provides legal services to the entire Washington D.C. metropolitan area. Whether prospective clients find themselves in Maryland, the District of Columbia, or Virginia, we are able to help with our rich experience in a wide range of legal practices areas. Put simply, we are lawyers for your life. We are dedicated to solving real-life problems. Whether you have been accused of a crime, are starting a new business, plan on buying property, you’ve been accused of committing a crime, you’ve just experienced a loss of life in the family, or you yourself have recently suffered a major accident, we exist to help you navigate these potentially treacherous waters. We are of the opinion that businesses, of any kind, don’t generally stay open for nearly half of a century unless they are doing something right. 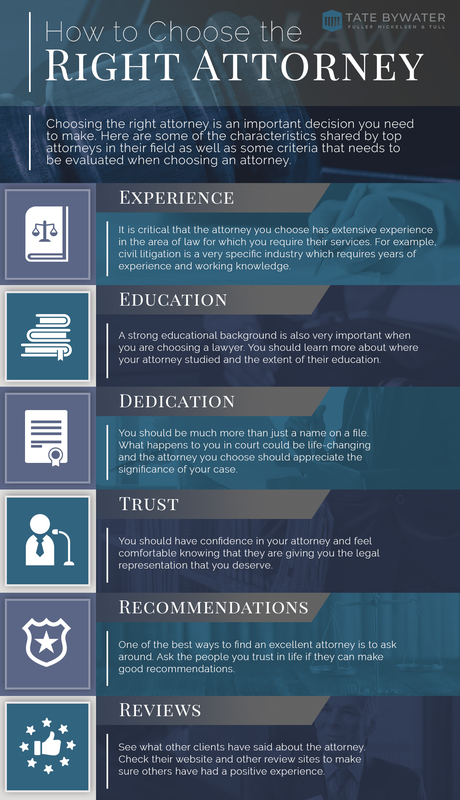 In today’s post, we’ll highlight what we do well in addition to offering up some practical tips in terms of helping someone select an attorney. While we naturally have our own horse in this race, we hope that you’ll find this post illuminating and pragmatic, regardless of which law firm you choose in the end. Keep reading if you could use some practical advice with regards to choosing a lawyer! Let’s be clear: there isn’t a formula that will guarantee success. Yes, even we at TATE BYWATER have failed to get ideal outcomes for some of our clients. But let us be equally candid when we note the importance of choosing the right kind of attorney. You don’t need to be an avid watcher of Arrested Development to understand that an inept lawyer can break your case, while a competent attorney can make it. Now that we’ve established the gravitas of the conversation at hand, allow us to offer some general guidelines to help you shape your research process. Yes, we know that “experience” is thrown out around a lot by marketers of businesses of all sorts, but let’s look at the reason for that — focused experience in a given industry actually has value. Whether the vertical in question is plumbing or legal in nature, having a professional who has been involved with past cases that were similar can only be a good thing. To that end, we have partners and other attorneys, each with their own specialty. 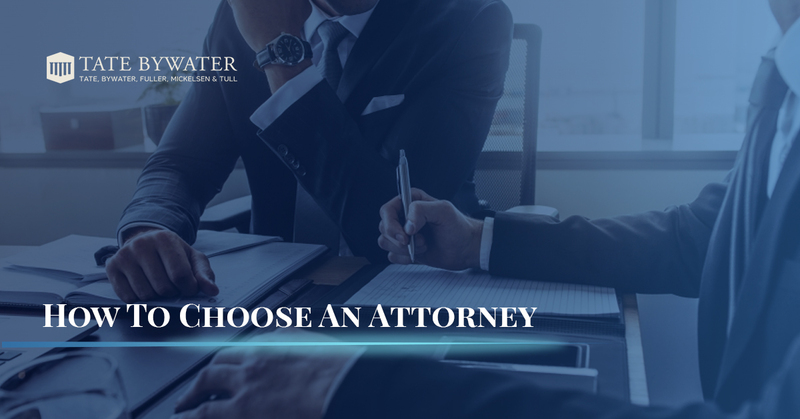 While all of our attorneys are knowledgeable in myriad fields, TATE BYWATER offers prospective clients the competitive advantage of having attorneys with a deep wisdom in their specialties. For example, James Tate, a founding partner, has areas of practice that include civil litigation, criminal defense, and personal injury. He’s received the AV Preeminent Peer Award for being Peer Rated for Highest Level of Professional Excellence, among his many accolades. Matthew Kennedy is fluent in both Spanish and English and has areas of practice that include immigration, criminal defense, domestic relations, and civil litigation. Don’t be afraid to ask your prospective lawyer about past clients, or cases, that have been similar in nature. If the lawyer in question is worth their salt, they’ll probably have already volunteered this information so you are made aware. In addition to asking if the prospective attorney has other clients in your industry, consider asking them about their connections. It’s not possible for any attorney to know everything there is to know about a given field. Therefore, it’s vital for an attorney to be both knowledgeable and well-connected. Let’s use the field of business law as an example. Certain business types necessitate expertise in sub-fields of business law. For instance, a design company might require a copyright law-specialist for a particular case. At TATE BYWATER, we are pretty much as experienced, competent, and knowledgeable as law firms come, but that doesn’t mean we are infallible. We have the connections that count when it comes to getting our client’s positive outcomes. That is our chief priority, and we are committed to going the extra mile to ensure we do everything in our power to make that a reality. No matter what kind of legal services you seek, it’s essential to inquire about fees during the initial meeting. It might seem obvious to state that you need to find a lawyer that you can afford — because it is. But that doesn’t mean that some folks will forget to ask about legal fees during their consultation. It’s best to get everything out in the open so that proper expectations and flowing communication can be established from the onset. At TATE BYWATER, we want to show our dedication to providing exceptional service from the very first interaction we have with our prospective clients. With offices in Vienna, VA, and Saint Leonard, MD, we are proud to offer complimentary consultations to those considering our legal services. We hope that you’ve found the above tips to be useful, but again, there is no unilateral method which guarantees a prosperous relationship with a law firm. There are certainly better ways to go about than others though. One of those “better ways” is to look at recognitions and client testimonials. With regards to the former, we at TATE BYWATER have received an AV® Preeminent™ Rating. This means that our law firm has been peer reviewed and recognized as AV® Preeminent™ by Martindale-Hubbell®, a significant rating accomplishment – and a testament that the firm’s attorneys are highly respected among their peers. Our attorneys have also received recognition from The National Trial Lawyers Top 100 Trial Lawyers and Super Lawyers — not to sing our own praises too much! Instead of doing that exact thing, we’d like to leave you with a few testimonials we’ve received. Of course, these are just two reviews among a sea of clients and cases we’ve been a part of over the years. If you are interested in learning more about what our team of legal experts can do for you, reach out to us to schedule your free consultation today.